Looks like someone stole my broom! Happy Kitchen Sink Stamps Monday, thanks for stopping by, I hope you had a great weekend! 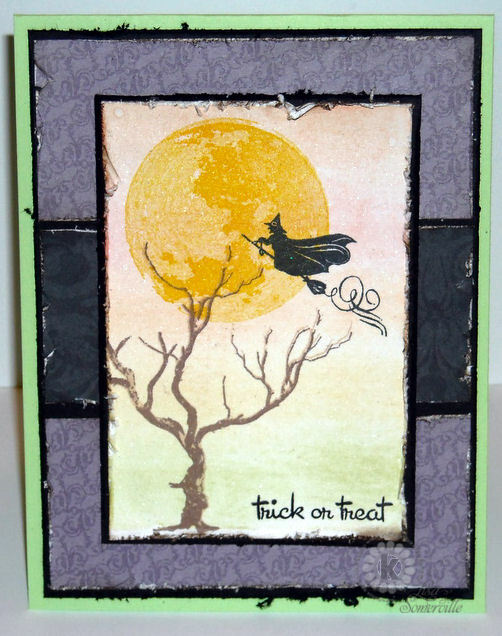 Just having a little fun mixing some of Kitchen Sink Stamps image to create a quick Halloween card. Great halloween card! Love the spooky scene you created. The distressing adds a fantastic detail. It was I....I cannot tell a lie! Adorable! Love this adorable Halloween design, Lisa, with all the fabulous distressing!! Beautiful work with these great images!! Wow, love that moon, the soft colors of the scene really make the witch and moon pop off the page, awesome work. Oh, that's where my broom is at? Great halloween card! There's always "Rent a Broom"! Fabulous Boo card! !